This is a two page information sheet. The second page has a piece by professional behaviorist and trainer, Debbie Connoly. There is a link to page 2 at the bottom of this page. If you are determined to get a Border Collie Puppy as a pet, on this page you can read about the pitfalls that are waiting for you when you start dealing with the people who are waiting to take your money. Border Collies are a working breed of dogs and, generally speaking, it is the exception rather than the rule to find individuals that will make good pets in domestic family environments. You may come across people who disagree with the above statement but it must be viewed in perspective. Although the numbers of BC's in pet homes is rapidly increasing they are still greatly outnumbered by those kept as working dogs. Of those percentage kept as pets, a significant proportion cause problems for their owners. Many owners cope with minor problems because they love their dog and the problems are acceptable compared with the idea of parting. The basic Five Freedoms of Animal Welfare are rapidly being adopted all over the world and form the basis of new animal welfare legislation in many countries with an enlightened attitude to such matters. Move forward with us to a better world. We expect any home we place a dog in to fully and willingly comply with the 'Freedoms' listed above. It is simple to understand the needs encompassed by the first three 'freedoms'. The last two can be more widely interpreted. Our puppy re-homing philosophy takes into consideration the needs encompassed by Freedom 4 - Freedom to express normal behaviour - and Freedom 5 - Freedom from fear and distress - as appropriate to our breed. It is based on our collective understanding and experience of Border Collies and the application of plain, old fashioned, common sense. The information on this page covers the rights, wrongs and pitfalls of taking on a Border Collie puppy as a pet. re-home Border Collie puppies to be trained as sheepdogs and do not place pups under 9 months of age in pet homes it will be of interest. It is generally not a good thing for the welfare of a Border Collie Puppy to be taken on as a pet without first having a chance to try out as a working dog. This breed is a working breed and they have not been bred to enhance the characteristics that make them suitable to be kept as domestic companion animals. They have been bred and designed to herd livestock. Selective breeding over hundreds of generations has 'fixed' certain instinctive responses in the breed. Selective breeding means that dogs with strong traits in a direction desirable for the selected discipline are the only ones chosen for breeding so that these traits are passed on, in strength, to the next generation. The Border Collie has been selectively bred to enhance characteristics that have made it into the best working sheepdog in the world. 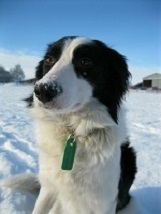 Until recently, no thought has been put into the breeding of Border Collies to make them happy domestic pets. Temperament has been low on the agenda with Shepherds and Stockmen who have been the exclusive keepers and developers of the breed until recent years. Their object has been to breed for working ability and intelligence so although they prefer their dogs to be friendly it hasn't been top of their list of priorities. In 1976, and only under pressure from Border Collie breeders clubs, the Kennel Club reluctantly recognised the breed and adopted a 'Breed Standard'. The 'Breed Standard' does not consider the dogs working ability, only its appearance and conformity to a pre-determined 'type'. The only material available for the KC breeders to use were the dogs of the Shepherds and Stockmen with their strong working inclinations. So this is where all Border Collies - from whatever source - have originally come from. Forty odd years of hobby breeding is not going to make a huge impression on the results of hundreds of generations of careful selection to cement herding instinct into the breed, no matter what anyone attempts to tell you, so you can expect any Border Collie to have the potential within it to work livestock and the inclination to work in that way. Those that do not carry this instinct are the exception, rather than the rule. At anywhere between 3 months to a year of age the natural instinct to work normally starts to rise in a Border Collie Puppy although it sometimes happens later. If the pup is in a domestic home and is not able to fulfill the awakening instincts this will lead to conflicts and confusion in the pup and resulting behavioural problems. Attempts to 'mold' the pup into a pet is forcing it to go against its natural instincts and will usually add to the problems it is experiencing and often create others. It is only when the instincts are weak in a Border Collie that it will be able to comfortably adapt to an alternative lifestyle. It will not suffer from the frustration it would feel when unable to fulfill the drives of its natural instincts as these instincts would not be strong enough to set up such conflicts. Border Collies that make happy companion dogs are those with low levels of working instinct and drive and this is impossible to accurately predict in a puppy of less than 9 months old. (The use of the phrase 'happy companion' is from the dogs perspective as opposed to the human perspective). This is why we say "it is generally not a good thing for the welfare of a Border Collie Puppy to be taken on as a pet without first having a chance to try out as a working dog". If you want a Border Collie puppy as a family pet you first need to face up to the fact that the arrangement you are proposing is for your own benefit and risks going against the best interests of the pup. So lets assume you have got your Border Collie puppy and look at what can happen if things go wrong? We have taken the following details from what people regularly tell us. These are not our words, these quotes are the words of some of the people who have contacted us and asked us to take in their problem Border Collies. It is a bit like listening to one of those looped tapes, we hear each reason so often. It began to dawn on us that we have Working Sheepdog in our living room. He is a restless little soul that hardly settles down for a minute. He follows us around the house, constantly at our heels and every time we turn around we trip over him. The puppy was a sweet little thing for the first few months, but it is now beginning to misbehave. It has begun to get a bit mouthy with the children and has started to flank around them and herd them into corners. If they try and escape it nips at them and rushes around in front of them to stop them from moving. When it plays with the kids it has started to get a bit rough and snappy. It tends to get very excited and uncontrollable and we are concerned that it might bite a child. Although friendly enough with our own children most of the time, it has started to bristle a bit when their friends come around to visit and becomes hyperactive when they all play. When we have visitors it gets very excited and jumps up on them. Sometimes it barks and whines. We have tried to stop this but it doesn't seem to respond that well and doesn't settle down for long and seldom relaxes in company. Every time we or our visitors move it is there, getting in the way and when our visitors try to leave it seems to be attempting to block them from getting to the door. It has started to chase things and our garden is becoming a 'no go' area for cats and birds. It has started to chew all sorts of things and we can't leave it alone and un-supervised for too long or it will have damaged something. It's chewed a mobile phone, some electrical cables, our skirting board and door frames and eaten quite a bit of carpet. We keep it in the kitchen at night and it has got up on the work surface and got behind the tumble drier and pushed it onto the floor. It also damaged my husbands mobile phone and a TV remote control and eaten the flex from the electric kettle. When I take it for a walk I daren't let it off the lead because it won't come back when I call it. When it's on the lead it tends to be aggressive towards other dogs and I have become worried that it may start a fight or induce another dog to attack it. Other dog owners look at me accusingly as they give me a wide berth when they pass. The odd thing is that when it is off the lead it seems fine with other dogs - until they get too close to me and then it dives in and nips them or shoulders between me and the other dog, looking a 'bit scary'. Its eyes get really wild. On the roadside it starts to jump out at passing traffic. When a car approaches it goes flat and watches, as it get closer and then, as it passes, it leaps out at the tires. We are concerned that if it ever got out alone it would cause an accident. It also jumps out at passing joggers, skateboards, bicycles - anything that moves really. We have tried to stick to country walks but this means passing through fields with livestock and I have to keep the dog on the lead or it will run off and chase. The pup chewed through the cable to the freezer in the utility room. Its done over £200 worth of damage and was lucky not to have electrocuted itself. It's also pulled the floor tiles up near the door and chewed plaster off the wall all the way back to the bricks. It is becoming obsessive about certain objects and won't leave some things alone. It has started to chase shadows or flicks and beams of reflected light. It chases its tail, spinning in tight circles and has even chewed patches of fur off its rear end. In the garden it is restless and rather destructive, pacing around and barking a lot at any noise or movement. It has stared to wear a path in the grass and jumps up at our neighbours fences if they are out in their garden. The relationship with the people next door has become a little strained. We have overheard comments that sounded like "their dog is a bit of a nutter". At dog training classes it has become a bit disruptive and on some occasions I have been asked to step outside for a while until it has calmed down. I have spoken to the trainer and to a behaviourist - I have paid one to attend my home and assess the dog and been given a fair bit of advice - but nothing seems to work for long and it is all becoming a bit of a nuisance and expensive. In fact, the whole family is rapidly getting to the end of our tether. The dog became so excited one day that it bit my son that just a few second before it seemed to have been playing with quite happily. Thank god it was our own kid, at least I haven't got to explain the damage to a friend and the decision as to what is going to happen next is still within my control. But now the kids are wary of the dog and it is obvious that it can't stay in the family for any longer. All we wanted was a family pet. We have just had a baby and my wife doesn't feel comfortable with the way the dog has been behaving around the child. It gets restless and looks at the baby in an odd way. It hasn't done anything wrong but she feels unhappy with its behaviour and doesn't trust it near the baby. Its also snapped at me when I tried to take it's collar and put it in the kitchen. So when you notice problems like this, what are you going to do about it? What can you do? Re-home the dog? That may not be as easy as it first appears. As there are so many pet dogs being taken to rescue centres, all the good ones will be full and with long waiting lists, so it will take some time for a space to come up. If the dog has bitten someone, particularly a child, many rescue centres will feel they could not responsibly re-home it and will not want to take it in. Some will suggest euthanasia, as will many vets under those circumstances. 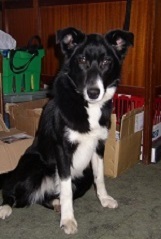 There are even some rescue centres who refuse to take in Border Collies, period. The breed can cause so much trouble in the kennels and frequently have so much baggage and behavioural problems that they will stick around for some time. In the time it takes to sort the dog out, the rescue could have helped half a dozen other dogs if that Border Collie had not been taking up the kennel space. One of the worst things about Border Collies in kennels is that fact that the problems a dog has when it comes in are often made worse after a few days in such an environment. Some dogs even develop problems because they are kenneled. 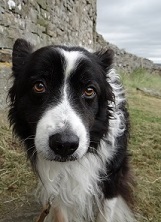 People often tell us that they went to such and such a rescue but didn't like any of the collies they had in because they barked at them when they stood outside the pen and looked in at the dogs. But lets assume that you do get your young dog into a rescue centre after a few weeks of waiting. What then? The rescue has a young dog that has behavioural problems and is not going to make a good pet for anyone because it will never be entirely happy in a pet environment. The answer that many rescues give is to seek someone with experience to take on the problem dog. Someone who has had collies before. Someone who like a challenge. The trouble is that the breed has so many variations that if you have kept a dozen in your lifetime you will not have seen a fraction of it. Rescues see dozens - even hundreds every year and even with their experience and general dog handling skills, the Border Collie is often a problem. And anyway, what's all this bit about a challenge. The Rubik cube is a challenge. Walking to the South Pole is a challenge. Swimming the channel is a challenge. Trying to make a dog go against its natural inclinations is like forcing a square peg into a round hole and is pure self indulgence. Think of the dog and what the dog needs. 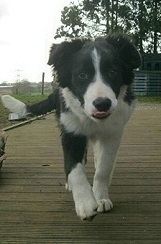 If the dogs problems are based on a frustrated herding instinct, perhaps it should be re-homed as a Sheepdog? Sadly most rescue centres don't assess or re-home working dogs. Although they can see the sense of this course of action in some circumstances they are concerned that the people that support them may not have the experience or understanding to see that this option is a good one for the dog. The concerns that stop them from homing a working dog onto a working farm is the fear of loss of support and income so many rescues have clauses in their governing documents that won't allow them to do it. Dogs they take in won't have much of an option other than to be found another home where it will be kept as a pet and so the cycle goes on with some dogs going out and coming back in to the rescue several times before it goes crazy, bites someone and has to be put down. Some rescue centres wont even consider pets on farms as a possibility and as rural pet homes with childless young couples and a few acres of land are few and far between, that narrows the options down a bit. So your troublesome puppy has found a space at a rescue centre. Your problem has been resolved, but what about the dog? Now let's assume that the dog does go to a rescue centre that will assess for stock work and, if appropriate, re-home to a shepherd or stockman that is looking for a dog to train. There are going to be a few conflicts that need to be unraveled first. A sheepdog is trained in a different way to a pet. We expect our pets to do as they are told, when we tell them but a Sheepdog is expected to think for itself and make its own decisions, relying on its instinct to guide it. Sometimes it has to work a long way away from its handler - even out of sight. It is closer to the sheep than its handler and can see things the handler may miss. A few sheep hidden behind a wall or in a dip. It needs to make its own decisions in these instances, going back for sheep it has missed and gathering them all into one flock to bring them in. If the dog has been trained in the obedience manner, this decision making process is eroded. It will hesitate and look back to its handler for instructions, taking its eye off the sheep and losing control of them. Teaching a dog to obey is an easy matter. It is far more difficult to teach it to think for itself after it has been made dependent on us to make its mind up for it. To a stockman a dog with this problem is less desirable than one that has not been inhibited by formal training. A good stock man trains his dogs in a kind way. He is not the teacher at the front of the class that instructs the dog and shows it what to do. He is the leader and guide that allows the dog to find out things for itself, and when it makes mistakes he guides the dog and shows it the error and allows it to correct the mistake itself. This is positive re-enforcement training techniques to the n'th degree and shepherds have been doing this for centuries. It is not a new obedience training method. It is important that a sheepdog grows up in the right environment so it can be trained from very young. Initially it simply follows the handler and the experienced dogs around the stock and watches the way they do it. It gets to observe and understand the various types of stock it will be working with. All of its life is an education. Eventually it gets to join in and its education progresses. A puppy taken on as a domestic pet is deprived of this important learning curve. We make our pets dependent on us in many other ways. For re-assurance and for company to name but two. In many stock working situations this is also a drawback. The dog needs to be self reliant and independent. It needs to be able to enjoy its free space and free time as well as its working time. It needs to be able to spend time on its own as well as in the company of its handler and it needs to be able to relate to other dogs, as most stockmen and shepherds have more than one dog they use to work with. It also needs to be able to work together with other dogs as a team, taking its own role and understanding its position. It should not feel the need to compete with the other dogs for the sole attention of its handler. So what is there about an unruly pet Border Collie that is frustrated because it can't work in the domestic home environment that will make it attractive to the working dog man? Sadly, very little. A lot of work needs to go into turning the dog around and getting it back on its own four feet. This is on top of any work that has to be done to rid the dog of its obsessions and behavioural abnormalities. The dog is effectively in limbo - not a good pet and not a good working dog. And all because some human wanted to have a Border Collie puppy as a pet. On the other hand, if a puppy goes into a home where it is to be trained as a Sheepdog and then decides it does not want to work it will not have the behavioural problems it picks up in pet homes. It can be housetrained and adapt to the life of a companion animal without feeling the conflicts because the instincts and drives are not strong enough to cause it a problem. If it comes into a rescue centre it can make the transition with little or no problem. It is also unlikely to chase sheep when its owner takes it for walks in the country and can get the best of both worlds and enjoy maximum freedom. In Border Collie Rescue we see this every day and we hear about it every day and we deal with it every day. No wonder we scratch our heads sometimes and ask ourselves, "Why do people do this to the dogs?". If you really do admire the breed, there is an alternative to taking a Border Collie Puppy as a pet. 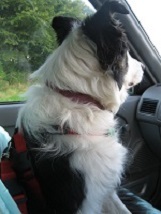 It is far better (for the potential owner as well as the dog) to only take on a Border Collie as a pet that is known to have low levels of herding instinct and drive. This means waiting until the pup has passed through the phase where the instinct develops and has been given the opportunity to work but has shown no interest. If the drive is strong it is better off working, but if it is not interested then you stand a better chance of making it into a happy and contented companion. Border Collies with strong herding instinct will herd anything that moves - it is natural behaviour and can be apparent in pups of just a few weeks of age. An early start does not mean anything - the dog may loose its interest later as it grows up - how it behaves around 6 to 9 months of age is the more crucial period of development to enable a handler to predict how the dog may turn out as an adult. There are also other advantages in taking on an older non-worker. You will get what you see and there should be little or no surprises for the owner as the dog gets older. If the dog is properly assessed before being taken on the new owner can handle it with confidence and avoid the potential behavioural problems developing. Our advice to someone who wishes to take on a Border Collie as a companion dog is to seek a dog that is at least one and a half years old and is known not to be interested in working. Best still, get one that has been bought up around livestock and has shown no interest - been taken to sheep but has not wanted to herd or chase - had the opportunity but said - "No Thanks". 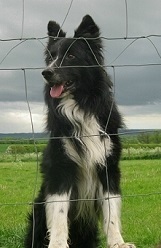 Such dogs can be trusted not to run off and chase sheep when walking in rural locations, whereas Border Collies who have never seen stock in their lives may well be fascinated by the sight and movement of sheep, thus restricting the freedom their owners can give them when walking in the countryside. There are many advantages in taking on a known 'non worker' to both dog and owner and the relationship is more likely to settle into a long term and fruitful one rather than be disrupted by behavioural problems, aggression and errant unpredictable behaviour that so often leads to people passing their young Border Collie on to an animal rescue organisation like ours. Every year we are asked to take in hundreds of Border Collies by members of the public who found they could not cope with them in their domestic environments. The vast majority of these are young dogs that had been taken on as pets when puppies. Many were purchased from farms. The reasons why people seek to re-home their Border Collies has been the same every year but the problem is getting much worse because more and more people are looking to make money out of the breed. 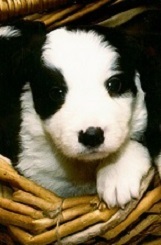 We are only overloaded because of peoples desire to own a Border Collie puppy as a pet. Unwanted farm dogs are far less of a problem than unwanted problem pets. At least unwanted farm dogs are usually put up for rescue because they don't want to work. 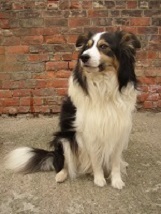 These can often make contented pets and have had the chance to try their herding instinct. It seems only fair that they should all get that chance. Puppies taken as pets are deprived of that opportunity and as a consequence many are deprived of a fulfilling life. Even so, taking on a non -working Border Collie as a pet can result in problems under certain circumstances. To understand this we need to understand other instinctive traits that have been bred into the Border Collie over the generations. 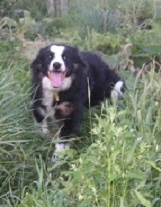 It is not just the instinct to herd that make the Border Collie what it is. To work in the way that a Shepherd needs his dog to work, other attributes are required. 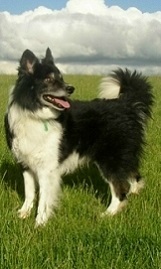 These have also been 'fixed' into the breed by selective breeding and enhance the herding drive. All sheepdog breeds have some herding drive but it is these additional traits that make the Border Collie the best. Border Collies have a strong instinct to bond with one person and this is often over-stimulated in a pet home because of the intimate nature of our relationship with our pet animals. It is this attribute that makes the breed so attractive to many of us. We all want a loyal pet and it is flattering to be the centre of the dogs attention. Border Collies fare best when they spend day time with their owner in a working relationship and at night spend time apart from their owners in their own space. If you do not get the balance right the dog becomes so dependent on being around the owner that it become stressed and suffers trauma in the absence of the owner. 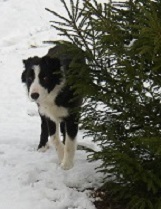 This is known as 'separation anxiety' and is a common problem with pet Border Collies. They will tend to follow the owner around like they are attached to them with elastic - sometimes very close - sometimes a few foot away - but always at the heel of the owner. If you are familiar with working sheepdogs you may have noticed that the stockman's dog is always there, in the background watching, but is content to keep a distance until needed. Unlike many pet Border Collies they do not feel the need to be so close they are constantly underfoot. They can also get confused if they have to share a relationship with more than one individual. They are bred to bond to one person and although they can switch allegiance with little problem, if they have two or more people demanding their attention at the same time it conflicts with their need to bond to one. "One Man and His Dog" is no coincidence, although one man can get the adoration and loyalty of many dogs without conflict. The Border Collie is now recognised as the most intelligent dog in the world and this is no coincidence - Shepherds have bred them to be this way. One problem with an intelligent dog is revealed when training. Most dogs will accept a command as a purely verbal instruction. It does not matter what else is going on or how the command is delivered - the word is enough because the dog looks no further. With the Border Collie we have a dog that can make fine distinctions. Not just in the way the command is verbally delivered but also in the accompanying hand movements and body posture of the handler. Even variations in the tone and volume of the command. 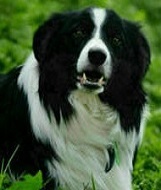 The Border Collie is an 'eye' dog and it will watch as well as listen. Its loyalty makes it want to please its handler and this will make it want to get things right. So if there are inconsistencies in the command the dog will question it and hesitate, making sure it is doing the right thing. If it is calm It will think about it before it acts. If it is hyped up it will be triggered to act before it thinks. Either way, if you are not a good trainer and consistent handler, the dog will appear to get things wrong, will appear to be hesitant in complying or doing the wrong thing and therefore be judged as disobedient. The fact is that it is simply trying to understand the subtle variations it is detecting in the instruction in order to make sure it does get it right and make you happy. In the USA, tests on a Border Collie called 'Rico' have revealed the dogs ability to distinguish between several hundred words, pick out words from a sentence and attach words to objects, colours and shapes. This is placing the breed up in the top league of intelligent mammals approaching that of Chimpanzees and Dolphins. If you do not allow for this in the breed, just imagine how frustrated your dog will get with you! Mental stimulation and the need for a 'Mission'. Border Collies have a strong drive to be occupied and busy and as they are bred to be very intelligent they do need a lot of mental stimulation to keep them happy - they also need a fair bit of physical exercise to keep them healthy, but the need for mental stimulation outweighs this. They are not hearthrug dogs and are not easy to train as they are bred to make their own decisions in the work they are designed to do and, as said above, sometimes obedience training exercises will undermine their ability to make these decisions themselves and lead to frustration. If you don't have some sort of mission for your Border Collie you are condemning your dog to a life of boredom and frustration. Chances are that it will make up its own mission and this may not suit you at all. The environment the dog is in can also contribute to problems in a pet home. They are a country breed and as such instinctively expect to have large areas of territory around them which they can call their own. In human environments this 'space' will be occupied with neighbours and many people coming and going, lots of background noises and movement. All these tend to stimulate the dog and it becomes hyperactive in urban environments, which again leads to problems. In town environments there is always something going on in the background. We humans can get used to this and ignore it but it is not so easy for a dog to blank out this disturbance. 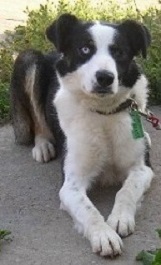 They are more sensitive to sound and the Border Collie is also very sensitive to movement. Imagine living in a situation where you had to shout to get yourself heard and never got a moments peace. How long would you last? 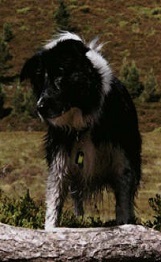 The Border Collie is not naturally hyperactive as a breed but those kept as pets, particularly in towns, are famous for demonstrating hyperactive behaviour. Once wound up a Border Collie can be snappy, chase anything that moves and are particularly problematic around young children and can be very intolerant of other dogs when being walked. In towns or on housing estates they are inclined to be hyperactive most of the time. It is often said that Border Collies do not do well in kennels because they are surrounded by, and facing into, other kennels with other dogs making noises and running around. This overstimulated the Border Collie and makes it hyperactive and distressed. What a lot of people find difficult to understand is that the only difference between that and a row of terraced houses or a housing estate is the scale. It is proximity of neighbours, background noise and movement of people and vehicles to and fro that wind up the dog. This is why we have certain policies that are there for the welfare of dogs and protection of potential owners. We do not re-home puppies as pets. For all the reasons listed above. All puppies we take in are assessed thoroughly and if appropriate will go to stock working homes where they can be trained to work livestock - this is what they have been bred to do for centuries. We research their background and, if available, pedigree and we observe them in a working environment. If they seem to be slow starters we keep them in our care and in the sort of environment that is natural to the development of their traits. We don't put them into situations that would conflict with their development. We will only offer dogs to be companions or pets if the dogs has been assessed and has shown itself to be a non-worker - and only then is the temperament is right. 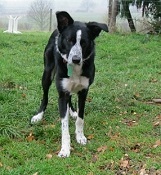 We do not home Border Collies in to towns or urban environments. Even where we have assessed a dog to be suitable as a companion animal. We look for rural homes, small villages or homes that are on the very edge of an urban area and are relatively quiet and free of background human noise. This is better for the breed and that is what we are here for - to make things better for the breed. We do not home where people work full time or where the dog is to be left home alone for regular and long periods of the day. This sort of lifestyle is not good for a Border Collie - they require a balance of human contact and free time - either extreme can cause problems. We do not home into families where there are children of 7 years of age or younger residing in the household or where children of this age are likely to be frequent visitors. Children of this age can often, inadvertently, over stimulate a border collie by triggering its instinctive reactions and end up getting nipped or bitten and sometimes even seriously attacked. We have taken on these policies because we have a duty to look after the welfare of the dogs people pass on to us and because we have a responsibility to the people who seek to take a dog from us. Many animal rescue organisations agree with these policies and it is usually only people with a vested interest in selling or getting rid of a dog that will advise differently. There are many breeds of dog that are far more domesticated than the Border Collie and will make a suitable and happy pet in most circumstances. There are also some collie cross breeds that will settle in as pets, but pure Border Collies, especially those from working lines (which accounts for all Border Collies if you go back a few generations in bloodlines) are bred purely to be working animals in a working environment. If you are set on acquiring a puppy to be a companion or pet, we suggest another breed and you could contact an all breed rescue organisation like the RSPCA, Dogs Trust, Blue Cross or any reputable registered animal rescue organisation for advice on the most suitable breed for your circumstances. If you have a problem digesting and accepting the information above, bear this in mind. We are not selling anything. We have nothing to gain in persuading people not to take Border Collies on as pets, other than less problems for dogs in the future and less problems for us to deal with in the future. We are volunteers and this does not earn us money. We can say this because we know - from experience and day to day appeals from the public to take in their pets - that this is the reality we face. This is a two page leaflet. The next page has a piece by professional behaviorist and trainer, Debbie Connoly. To go on to page two click here. The last bit of information below can be found in other parts of this website. It is general information about the pitfalls of acquiring a Border Collie these days and what warning signs to look out for. It applies to puppies or adult dogs. In fact it applies to any dog breed, size, age or gender. GET A DOG from a responsible Rescue organisation. RSPCA - Blue Cross - NCDL - The Dogs Home Battersea, Border Collie Rescue and many others are organisations where the staff will take the time and trouble to assess the dogs properly and advise you and help you to find the right dog that will fit in to your home and circumstances. Only use a regulated organisation, either a registered charity or a registered non profit charitable company. Make sure whatever organisation you use has a constitution or governing document that makes the organisation the owner of all its funds and assets instead of them belonging to the people who run it. Beware of those 'rescues' posing as 'good causes' and calling themselves 'Non-Profits' or 'Not for Profit'. These terms have no legal basis in the UK unless they refer to incorporated organisations that have governing documents set out for that purpose. Calling yourself a non-profit does not make you one. These rescues are commercial and their funds and assets are the property of their owners - they are businesses that have been set up to exploit the situation of unwanted dogs and they make their money from taking in dogs given to them free of charge and selling them on under a 're-homing' contract for a fixed donation. Frequently these businesses import dogs from abroad, including puppies and pass them on as rescued dogs. Some are genuine rescue dogs from rescue organisations abroad who will pay all costs involved in vaccinating, neutering and transporting the dogs to the UK so the business only has to collect them from the port of entry and keep and feed them until they are re-homed. It can be very profitable. What business could refuse free stock to sell? Always look for a charity or company number before dealing with them. Check them out and if they are a private business we suggest you do not deal with them. If you have to buy a Border Collie pup, in the good old days we would have said get one from a responsible Kennel Club or other registered breeder. Unfortunately times have changed and you cannot take such sources for granted. The Kennel Club is not a charity or a dog welfare organisation, it is a private members club and its responsibility is to its voting members. Most of its members are breeders so to a great extend the members dictate how it is run with their vote. The KC registers breeders for a fee and lists 'accredited breeders' as a reliable source of puppies but has a poor reputation for checking out the breeders it recommends on its lists so - buyer beware. The KC also has little or no knowledge of the rescues they recommend and many rescues they list are commercial businesses. You only need a letter from a vet to get listed and vets seldom refuse such a service to a client. These days a listing or recommendation of any sort from the kennel club is risky and not worth taking up. If buying from a breeder of any sort, make sure you meet the Sire and Dam (don’t buy unless you do) and ensure they are tested and certified to be free of hereditary diseases and that they have a good temperament. Don’t pay any money over until you have copies of any promised pedigree or registration certificates. Ask questions about the background of the dog and its parents. It is not unreasonable to be seen to be responsible. If answers are evasive, defensive, offhand or aggressive or in any way unsatisfactory or dubious - look elsewhere. But get your advice from someone who is not trying to sell you a dog.